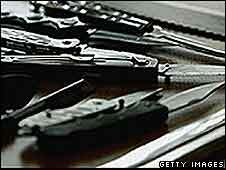 Dorset has recorded the lowest level of knife crime in any county force across England and Wales, figures show. Home Office statistics revealed in the last 12 months to March there were 47 serious crimes involved a bladed instrument in the county. Police-recorded crime in Dorset dropped 7%, compared to 9% overall. The force came out top for public confidence. Chief Constable Martin Baker said it was a "significant achievement" and crime was at a five-year low. He said: "Trends for the current year show continued improvement. "We are making it increasingly difficult for criminals to operate within Dorset." Dorset came second only to the square mile area of the City of London, which recorded 19 incidents for the lowest level of knife crime. The force came out top for public confidence with 64% of people questioned rating it good or excellent - this compared to the average of 53% for England and Wales. Chief Constable Baker added: "It is particularly pleasing to know that we have earned the respect of people across Dorset by achieving the highest public confidence levels in the country." Drugs offences in Dorset rose 2% from last year - compared to a rise of 18% for England and Wales. Fraud and forgery saw the biggest fall dropping 39%, but robbery rose 28%.